Sebastian Bendix is a Los Angeles based writer and musician, as well as host of midnight horror film series, Friday Night Frights. He attended school at Emerson College for creative writing and spent his formative years in Boston playing in popular local band The Ghost of Tony Gold. Upon moving to LA he transitioned back to writing, contributing articles for the entertainment site CHUD.com and the print publication Mean Magazine. Stepping into the world of horror fiction, Bendix has found success both online and in print with numerous stories published in the genre imprints Grinning Skull Press, Encounters Magazine, Sanitarium Magazine, Xchyler Publishing and noted podcast The Wicked Library. Bendix self-published his first horror/fantasy novel The Patchwork Girl in 2013, and his second novel, The Stronghold, is a ripped-from-the-headlines thriller that will be published in Fall 2017. Also an avid film lover, Bendix has a sci fi/horror script that has been optioned and is in development. 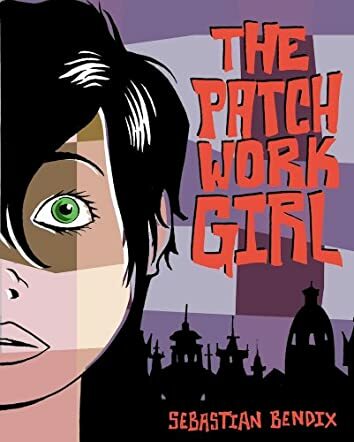 In The Patchwork Girl by Sebastian Bendix, 16-year-old Padget Beaumont is trudging through life－her scientist dad has mysteriously disappeared for months, she is shunned at school, and lost her best friend because of a boy. Padget is determined to face these annoying hardships and everything seems to get better, albeit slowly. Unfortunately, when her skin is strangely transformed into a bizarre, calico patchwork, and her gym teacher attacks her without reason, Padget is forced to escape to another dimension, to the city of Nusalem to be exact. She must search for her missing father there while trying to survive the dangerous city. The intriguing premise is delivered in a solid plot, and the clear cut prose paves the way for a flawless read. There are witches, vampires, demons, werewolves and several creepy antagonists enough to satisfy the supernatural fans. There’s a good dose of sci-fi element too. The characterization is good, although I’m most fond of Sundown, Padget’s pet python. My only peeve is that I’m not quite happy with how things turn out for some characters. That said, I don’t consider this as a flaw in the story. The level of violence and grotesque in this dark supernatural is expected and definitely not for young teens. On the whole, even though The Patchwork Girl is geared towards YA readers, some older readers would find it a solid read. It deserves a place in the supernatural/fantasy genre as a good page turner from Sebastian Bendix.